The new 5.0 version of Skype for Windows launched today with Facebook integration, allowing you to interact with your Facebook News Feed from within the Skype application. Facebook users can update your status, comment on your friends' posts and "like", just as you would within Facebook. If your friends have telephone contact information in Facebook, there will be a Skype icon next to their posts that will let you instantly call or SMS them using Skype credits. The Skype Facebook integration goes one step further, though, with a Facebook Phonebook in Skype that pulls in contact information for your Facebook friends. If your Facebook friend is also a Skype contact, you can make a free Skype-to-Skype call. For those who spend a lot of time in Skype, the Facebook feature will be a welcome addition. However, there are limitations. To interact more deeply with people or posts—basically anything outside the News Feed—Skype kicks you back out to Facebook itself. It would probably be more useful for most if Skype were integrated into Facebook, rather than the other way around. But this may be the first step in that process. And there is no way to add Facebook friends to your Skype contact list directly, or even see which of them are Skype users unless they are already a Skype contact. Also included in the Skype 5.0 release is an updated look and feel and an open beta version of Skype's group video calling. 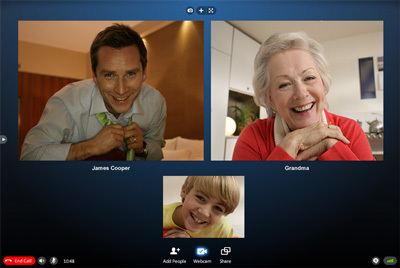 Group video calling offers a "dynamic view" feature that automatically shifts the focus to the person speaking on the call. Group video calling is free for now, but will become a paid feature at some point. Finally, Skype introduced automatic call recovery, which helps you reconnect calls that are interrupted due to Internet connection problems.